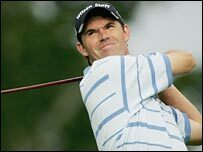 Padraig Harrington has pulled out of this week's Open following the death of his father, Patrick. Harrington found out his father had cancer of the oesophagus in March and missed last week's Scottish Open after the condition deteriorated. A spokeswoman for Harrington's management company said the Dubliner was "devastated". Sweden's Henrik Stenson, who is 79th on last week's world rankings, will take Harrington's place. The Dubliner considered missing the Players Championship and Masters, but his father's condition was such that he was able to make the trip to the US. Harrington went on to win the Barclays Classic in New York last month but his father's illness continued to worsen. "I've had the best possible background for playing golf, for playing all sports," said Harrington in March. "I couldn't have got more encouragement from my dad without ever in any sense pushing or wanting to live his life through my sports. "It was top-notch. When I was growing up my dad was a very competitive, very intelligent player and he just taught me the art of scoring. "He would never tell me how to swing the club, but encouraged me to score well and at the end of the day that's really where my talents lie." Harrington has played in seven Opens, with his best performance to date a tie for fifth at St Andrews five years ago. He won last week's JP McManus Invitational Pro-Am in Ireland by six shots.